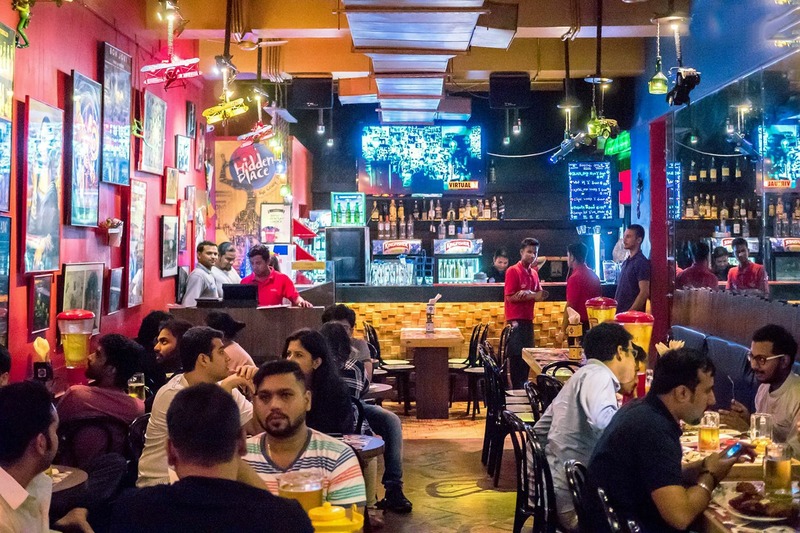 Hidden Place at Dhole Patil Road is Pune’s version of a typical American corner pub, known for retro rock music and pocket-friendly booze during happy hours. Started by Sunil Chandani, Hidden Place is your daily, no-nonsense watering hole where nothing else matters other than your mug of chilled beer, great music and scrumptious bar bites. The decor, in fact, compliments the essence of the place. Walls adorn funky urban art featuring Beatles, Pink Floyd, Marilyn Manson and psychedelic paintings that only make sense after a couple of kamikaze shots; old-school mahogany seating that blends in well with polished wooden flooring; an open bar with a wall-mount television (for live matches)which is a colour blast of reds and neon. Music at Hidden Place is perpetually at full blast, but what saves the day is their collection which is strictly 70’s and 80’s pop and metal with subtle additions of alternative rock by Linkin Park, Pearl Jam and Radiohead. The best time to hit the place is during happy hours, which happens between 12.00 pm and 9.00 pm on Mondays and Wednesdays; all day long on Tuesdays and Thursdays and between 12.00 pm and 8.00 pm during weekends. Large groups, highly recommend you order the legendary beer tower which is quite affordable and easily suffices 5-6 people. If you’re not a beer person, go for Hidden’s popular cocktail, Mud Slide – a sweet concoction of vodka, Bailey’s, Kahlua, chocolate sauce, cold cream and bonbon. What goes well with the drinks are buffalo wings smeared in red tangy sauce and a plate of mutton kheema with pav. Party animals, Hidden Place is just the kind of place for you!